Researchers have identified a new species of leopard frog living in largely urban areas in the Interstate 95 corridor from the metropolitan tri-state area as far south as North Carolina. A scientist from the New York Natural Heritage Program, which is administered through ESF, contributed to a report Oct. 29 in the journal "PLOS ONE" that the new species has been named the Atlantic Coast leopard frog. The frog was identified as a separate species largely because of its distinctive call, a "chuck" that sounds more like the call of a wood frog than the noises made by other species of leopard frogs. Bioacoustic testing set it apart. "The call is what really gave it away," said Dr. Matthew Schlesinger, a zoologist with the Natural Heritage Program. "Now we can say its call is definitely different from the northern and southern leopard frogs and its morphology and patterning are somewhat different." The frog became a subject of research several years ago when a Rutgers University graduate student began researching southern leopard frogs in southern New York state. Schlesinger, who got involved in the project about seven years ago, said researchers noticed the frogs did not look like southern leopard frogs elsewhere. "We started to think there might be something else here, a cryptic species that's morphologically similar to other species but turns out to be different genetically and perhaps in other ways," he said. Schlesinger and his colleagues teamed up with geneticists now at the University of California at Los Angeles, who analyzed tissue samples and found evidence this frog is a distinct species. Those genetic differences were described in a publication two years ago but the research team stopped short of naming the species and compiling a formal taxonomic description. Now, he said, the bioacoustic description and the morphological data that describes the frog's appearance and measurements establish it as a distinct species. Because of the frog's occurrence in urban areas, including the New Jersey Meadowlands, the paper reporting the study is titled, "Cryptic Diversity in Metropolis." The frog, which would fit comfortably in the palm of an adult's hand, is found primarily in large wetlands with open canopies. Schlesinger and his colleagues are now halfway through a two-year study to determine the frog's distribution and population status through nine states from Rhode Island to Virginia. 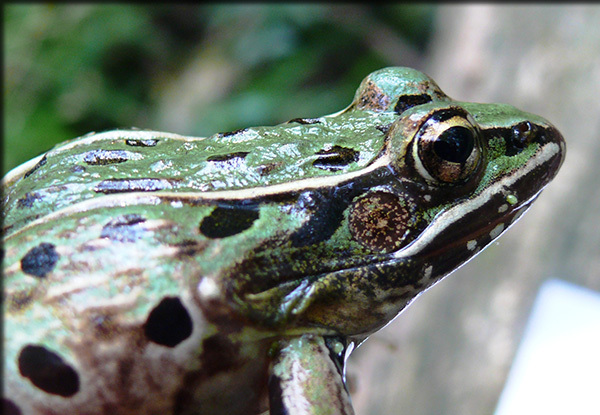 "Much to their credit, the Atlantic coast leopard frog team guided by Matt Schlesinger has not stopped at simply describing this remarkable new discovery," said Dr. James Gibbs, a professor of vertebrate conservation biology and the director of ESF's Roosevelt Wild Life Station. "They are now embarking on the more complicated and arduous process of defining where the species occurs, what its habitat needs are, and how we can assure its persistence into the future." Schlesinger said the discovery of a new species can help shape wildlife management practices; those tasked with managing wildlife populations need to know what they are managing. "In some states, leopard frogs are considered endangered, threatened or species of special concern but states could be managing for the wrong species," he said. "I put great value in biodiversity. Every one of those species has some intrinsic value." D.J. Evans, the director of the N.Y. Natural Heritage Program, said the identification of a new species is a rare opportunity for a scientist. She believes it is the first new species described in the program's nearly 30-year history. "Most scientists who work in the field never have the opportunity to discover something new in their careers," she said. "This is an amazing find for these scientists and for our program.". The lead author on the paper is Jeremy A. Feinberg of Rutgers University. Other contributors are Catherine E. Newman of Louisiana State University, Gregory J. Watkins-Colwell of Yale Peabody Museum of Natural History, Brian Zarate of the N.J. Division of Fish and Wildlife, Brian R. Curry of the University of California at Los Angeles, H. Bradley Shaffer of UCLA, and Joanna Burger of Rutgers.